A previous blog told about families in a Thai village becoming free from opium addiction and what that freedom means for husband-wife relationships. To gain this freedom people needed economic alternatives as well as changes of heart. In Laos World Renew helps send opium addicts to rustic treatment centers and also helps opium producing villages try alternative cash crops. In Phongsaly province, opium addicts’ families are often the poorest among the poor. Sometimes opium-addicted fathers actually sell the rice harvest leaving their families without rice. And the addiction consumes both their money ($2/day) and their time, as they wile away many hours smoking. As a result, both families and whole villages languish. In the face of this multi-faceted challenge World Renew is trying to introduce coffee as an alternative cash crop in the we hope will help a villages in Laos overcome opium like the Hwai Tong Kaw villagers in Thailand. 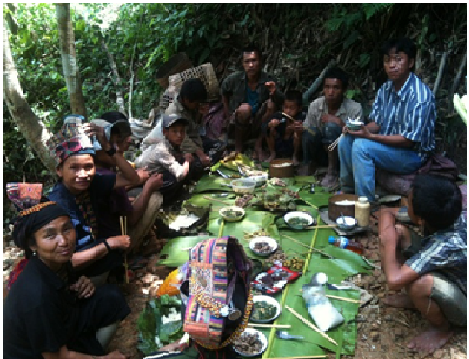 Members of the 5 family coffee group having a meal together on site of improving water supply at their coffee processing place. Te Cheh is right in the center in the back and his wife, Che Cha is the second from the left. While farming and using opium Te Cheh and his wife, Cheh Cha, used to be one of their village’s poorest families. World Renew started a coffee as cash crop experiment in 2011, with the hope it could provide Te Cheh and Cheh Cha a choice. Coffee cultivation was something new to the village. Villagers weighed the options. Opium takes only 6 months from planting to harvest and gives good returns, while coffee that takes 3 years and requires more work. 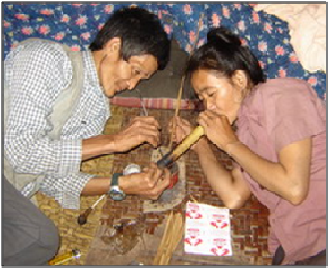 Opium is illegal, exposing growers to persecution. Two of the richest families decided to go “all in” in coffee. A few others took smaller steps, trying coffee on small plots. Eventually, even Te Cheh and his family became part of the coffee nursery project and planted 3000 little coffee trees. Te Cheh confesses that he always felt guilty that he spent little or no time at all providing for the family during his addiction, but now, with the help of World Renew, he wants to make coffee their family business and give his children an opportunity for a brighter future. People need hope, opportunities and choices. We hope that with a little push and encouragement, they will conquer the slavery of opium.